I've been a fan of Kate Beaton's Hark! A Vagrant webcomic for longer than I can remember. My 2014 wall calender was Hark! A Vagrant and I remember having long, hilarious conversations about Beaton's comics after class at uni. We were literature students, and jokes about Hamlet were always going to be funny. To summarise quickly, Hark! 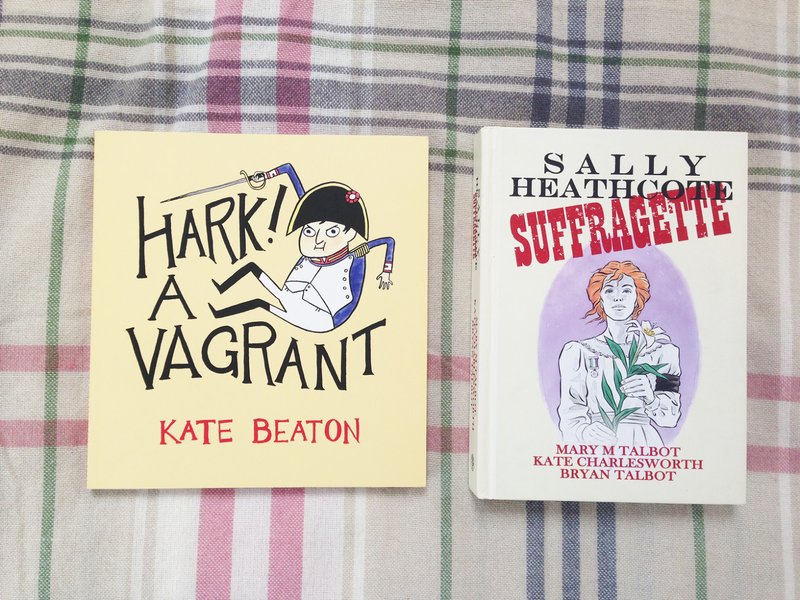 A Vagrant is a collection of comedic (read: bloody hilarious) comic strips about literature and historical figures. Most of them highlight the poor decisions of these figures, ones we can thankfully look back and laugh at, and sometimes even relate to. It took me far too long to pick up her physical book (published in 2011, for shame) but I was so glad that I did. Although a lot of it is reprints of her webcomics, I couldn't have cared less. Beaton's talent for making me belly-laugh using simply three panels is beyond me and I will be sure to reread this over and over whenever I'm feeling down. I particularly enjoy her damning portrayals of the characters of The Great Gatsby that really do make you realise how awful they all are. How many of us forgot that Daisy had a daughter throughout the whole novel? Apparently Daisy did too. This got a very easy five stars from me. On a less humorous note, but also only slightly less enjoyable, is Mary M. Talbot's Sally Heathcote: Suffragette. I met Mary's husband Bryan, also a comic book artist, at a festival many years ago after a talk he gave on what was his most recent creation, Grandville Mon Amour (part of a series about an anthropomorphic Detective Inspector badger, also worth a read). I was unaware Mary was also a comic book artist until I saw Sally Heathcote in my local Waterstones and new I had to have it. It tells the story of a fictional suffragette (who I disappointingly didn't know was fictional until I came to look her up afterwards) and her story from being a young maid to a household name as part of the Suffragist movement. The story is a painful one, at times, covering the treatment of women who both did and did not participate in the rallies run by the Pankhurst's. It also tells the story of the split in the movement between the more radical Women's Suffrage Federation and the original Women's Social and Political Union, which also split the Pankhurst family apart. For the most part I found this graphic novel absorbing and hugely educational, but I can't help but feel that it ended far too abruptly and on a note of romance rather than the main thread of the work. Four stars from me.